Click the image to see the artist's credit. The people of God have always needed to be organized, and they have complained when the organization doesn't serve them well. That's the context of today's first reading, where God gives the leader Moses some extra help. Moses doesn't mind that the help is somewhat hard to manage. In the reading from James three weeks ago, the apostle asked the community to treat its poor as well as it treats its rich members. Last week he ordered the members to be honest about their envy. Today he warns of the fatal consequences of greed, both for the greedy and for the community. Much of Mark's gospel is about Jesus educating his disciples about what it means to be a disciple. Here his disciples show a certain narrow-mindedness that Jesus has to correct. The Situation Within the Situation: At the outer level, Numbers was written after the Exile, in the 6th century B.C.E., by Jewish priests hoping to put the broken nation back together, and keep it faithful to God. Faithfulness to God, in the minds of these priests, meant strict monotheism, attention to ritual detail, and keeping the moral requirements of the more ancient Law. Their method was to retell the story of the Exodus, from the 12th century B.C.E., with emphasis on the issues they deemed important in the present. The inner level of Numbers, chapter 11, has two stories of God's responses to the continuing complaints of the wandering Israelites. One response is enclosed within the other. The people had complained earlier about their hunger, and God had given them manna. Now they're lamenting the absence of meat from their diet, comparing the manna unfavorably to the variety of foods they had while enslaved in Egypt. Interestingly, the Lord's first response is to bolster Moses with some helpers. He tells Moses to gather seventy elders. The Lord promises to "take some of the spirit that is on you and put it on them. Then they will bear the burden of [leading] the people with you." "To the people, however, you [Moses] shall say: Sanctify yourselves for tomorrow, when you shall have meat to eat. For in the hearing of the LORD you have cried, 'Would that we had meat for food! Oh, how well off we were in Egypt!' Therefore the LORD will give you meat for food, and you will eat it, not for one day, or two days, or five, or ten, or twenty days, but for a whole month-until it comes out of your very nostrils and becomes loathsome to you. For you have spurned the LORD who is in your midst, and in his presence you have wailed, 'Why did we ever leave Egypt?'" Then follows the passage that is our Sunday reading, just a small part of the whole, but a fragment that finds an echo in today's gospel. A Modestly Proposed Interpretation: What I've called the two inner stories seem drafted to fit the outer situation, the priestly writers' purpose of putting the nation back together after exile. There were complainers in post-exilic Judah, and there were even Jews who voluntarily stayed behind in Babylon when they could have come home. The writers may be comparing them to the ungrateful Israelites of the Exodus. Secondly, there's a great endorsement of the authority of these priest-scribes in the story of God spreading Moses' spirit among seventy elders, although that's undermined by Moses' wish that all might become prophets.
" and its cognate words: The third vowel in the verb "
," and the third vowel in "
," all have a long I sound. They rhyme with "die," "died" and "dying." " rhymes with "see." But this noun does not appear in today's English lectionary selections (whether Protestant or Catholic, U.S. or world). So if you were to say, "The Spirit prompted Eldad to prophesy, and prompted Medad to deliver a prophecy," then the words have different sounds. Proclaiming the Story in Detail: The original audience of this story believed that prophesying was a special gift. God both empowered and compelled some people to speak to others with God's own authority. That's no small matter. So they were wary of anyone prophesying without all the right credentials. In this story, two elders missed the prophet-ordination ceremony but prophesied anyway. To object to that seems like nit-picking to us, but it was very troubling to the people among whom it happened. What's really instructive, though, is the contrast between Joshua's response to this and Moses' response. To proclaim this part of the story correctly, fix in your mind the differences between Joshua and Moses. Joshua is, relative to Moses, a young buck. He knows he'll inherit authority when Moses finally dies, but now he has only ambition. Moses, on the other hand, speaks from decades of experience. He's the one whose mother, when he was an infant and the Egyptians were slaughtering Hebrew babies, put him in a basket and set him adrift in a swamp. He's the one found and adopted by the daughter of the Pharaoh. He's the one who grew up in Pharaoh's court and enjoyed power and privilege. He's the one to whom the Lord spoke from the burning bush. He's the one who went back to challenge the Pharaoh, and to bring ten plagues upon Egypt. He led the Hebrews out of Egypt through the sea. He received the Covenant from the Lord on Mount Sinai. Is this Moses going to get upset because two guys named Eldad and Medad were prophesying without a union card? No! Moses has a much grander vision. He wants all the people to prophesy. Moses was way ahead of his time, but not ahead of our time. Your task, as lector, is to make your congregation want to exercise all the gifts God gives them, no matter what their places in any hierarchy. So, by your enthusiastic proclamation, contrasting tones of voice, and emphasis on both occurrences of the word "all," make your listeners say "Yes!" to Moses' vision. That's how you'll express Moses' superior wisdom, and the point of this passage. 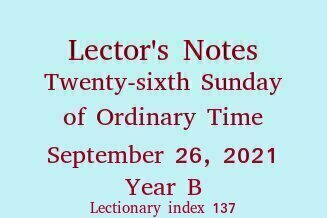 The Historical Background: We have introduced the Letter of James in recent Lector's Notes. Today's passage is a straightforward moral condemnation of those who enrich themselves by treating others unfairly. In the hardscrabble economy of the ancient Middle East, to withhold a day-laborer's wage was a terrible injustice, tantamount to murder. So James is merciless in his condemnation of ill-gotten wealth. There's hardly a more emphatic passage in the New Testament. Proclaiming It Emphatically: Don't be afraid to express James' outrage in your own voice. While the economy has evolved, the moral imperative to treat others fairly is as compelling as ever. If someone among your hearers is guilty as charged here, give the blackguard a chance to hear himself or herself condemned, and be moved to repentance. And even those who don't cheat others could stand to have their sense of moral outrage sharpened. Neither good thing will happen if your proclamation has only the urgency of the announcement that coffee and donuts will be served after mass. 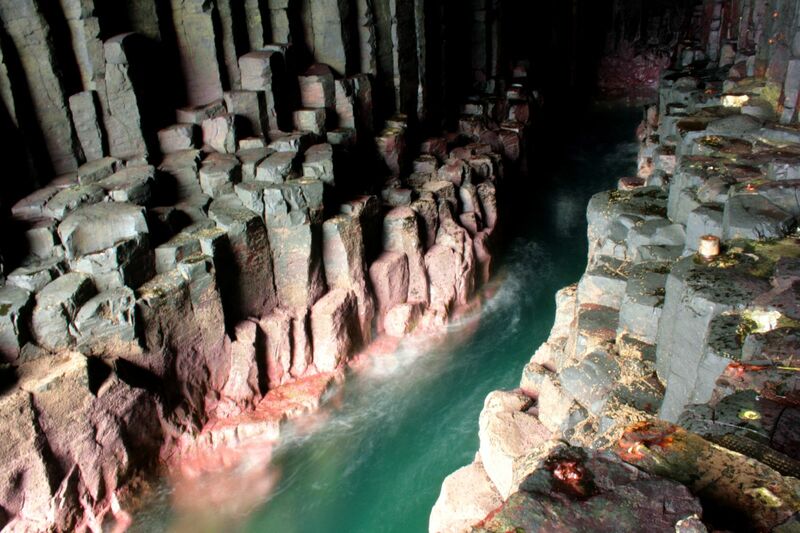 The late Diedrich A. Nelson ("Dan"), Lutheran pastor and college teacher in the Dakotas, U.S.A.
Father Roger Karban , scripture scholar, teacher, retired pastor in southern Illinois, U.S.A.
A photo of Fingal's Cave, a sea cave on the uninhabited island of Staffa, in the Inner Hebrides of Scotland. By way of bing.com, the image comes from this Italian-language web page. Click here for a larger version.